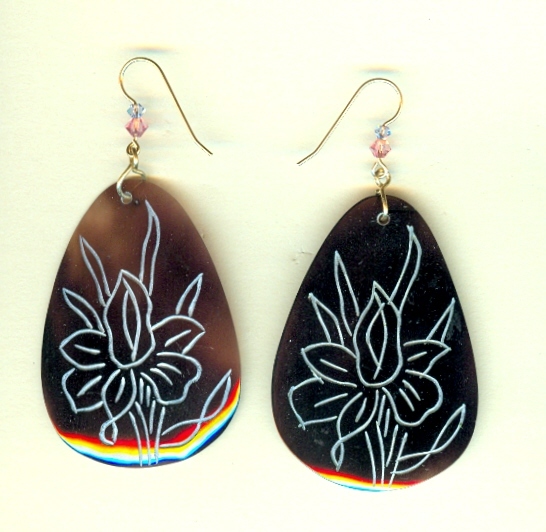 Light, long and lovely, these shell earrings are as delightful to look at as they are to wear. 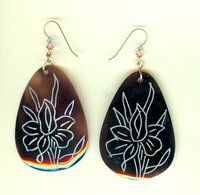 The pendants have a rich chocolate brown background and have been etched with a romantic lotus design. They dangle nearly three inches from the tops of their 14 kt gold fill French hooks, and measure about 1-3/8 inches at their widest points. The earring findings are embellished with coral and lavender Swarovski crystal bicone beads, which contrast perfectly with the chocolate brown background of the shell pendants. They?re another pair of lightweight lovelies from SPARKLE PLENTY. The spectacular black lotus pendant has been carved from serpentine and then dyed to achieve the rich, midnight colour. Here's a 23 inch strand of misty green and midnight blue that's as exotic as lotus blossoms on the Nile.